Taking their name from the Yiddish word beygl, these breakfast staples are said to have originated in Poland in the 17th century. The trademark central hole allowed the rolls to be strung up and transported by bakers. The dough should be fairly stiff and slow-risen, then twice-cooked – poached and baked – to deliver that distinctively chewy bite and glossy, crisp crust. Types of filling are limitless but it’s tough to beat a bagel done New York-style – smeared with soft cheese, then piled high with smoked salmon, shavings of red onion, plus a good squeeze of lemon and crack of black pepper. 1. Stir the malt extract (or honey) into 250ml hot (but not boiling) water. Mix the flour, yeast and salt in a large bowl, make a well in the centre and pour in the malt water and 1⁄2 the egg. Mix to a firm (but not dry) dough, rest for 5 minutes, then knead by hand for 10 minutes (or 5 minutes in a freestanding mixer). Put in a lightly oiled bowl, cover with cling film and leave to rise at room temperature for 2-3 hours. 2. Line a large baking sheet with lightly oiled baking parchment. Divide the dough into 8 equal pieces (roughly 100g each). Roll each into a smooth ball, turning in your hands and tucking the edges under. Press your thumb directly through the centre to make a hole, then roll between your fingers (or against the work surface) to create a ring with a 2-3cm hole in the middle. Place on the tray, smoother-side up and repeat with the remaining dough. Cover with oiled cling film and leave to rise for 30-40 minutes, until slightly puffed up. 3. Preheat the oven to 240 ̊C, gas mark 8; set a wire rack on the middle shelf and put a large roasting tin on the base of the oven. For the poaching liquid, bring a large saucepan of water to the boil, lower to a simmer and, one at a time, stir in the malt extract (or honey), bicarbonate of soda and salt (be careful as it will foam up). 4. Two or 3 at a time (depending on the size of your pan), gently lower the bagels into the simmering poaching liquid. Poach for 3 minutes, turning halfway through, then remove using a slotted spoon and place on a wire rack. Brush the tops lightly with the remaining egg and sprinkle with the seeds, then transfer back to the lined baking sheet. 5. 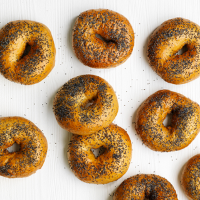 Once all the bagels have been poached, put the tray on the middle shelf of the oven and fill the bottom roasting tin with just-boiled water to create steam. Immediately lower the heat to 190 ̊C, gas mark 5, and bake for 15 minutes. (You may find it easier to poach and bake the bagels in 2 batches of 4.) Transfer to a wire rack and leave to cool completely before serving.